Last week I made a delicious, miraculous guacamole that will not turn brown. I assume the secret is the grapefruit flesh. I love grapefruit, so I added the flesh of two beautiful pink grapefruits straight to the guacamole. This is a very simple guacamole: avocado, grapefruit, green onions, salt. It's also quite beautiful if you use pink grapefruit because you can see the little pink bits poking out among the light green avocado and darker green onions. We ate this grapefruit guacamole alongside oven-roasted salmon, with multiple quesadillas, and on sandwiches with smoked salmon and cucumber. Even my grapefruit-wary kids loved it! Thanks to the California Avocado Commission for sending me a flat of delicious ripe California avocados to play with! A simple and delicious guacamole that won't turn brown. The secret ingredient: pink grapefruit. Cut the avocados in half and remove the pits. Scoop the avocado flesh into a large bowl and mash it with a fork or a potato masher.Supreme the grapefruits: Cut off the ends, the peel, and the white pith. Hold a grapefruit over the bowl with the avocado, then cut between the membranes, releasing the flesh of the grapefruit segments into the bowl. When you've cut all the grapefruit flesh away from the membrane, squeeze the membranes to extract all the remaining juice. Repeat with the other grapefruit. Mash the grapefruit flesh gently into the avocados; you want to retain some chunks, but most of the grapefruit should break up and mix in with the avocado.Stir in the green onions and salt, then mix to combine. Taste and add more salt if desired.Serve immediately. Note: Can be held in the refrigerator in a plastic container up to 5 days without significant discoloration. 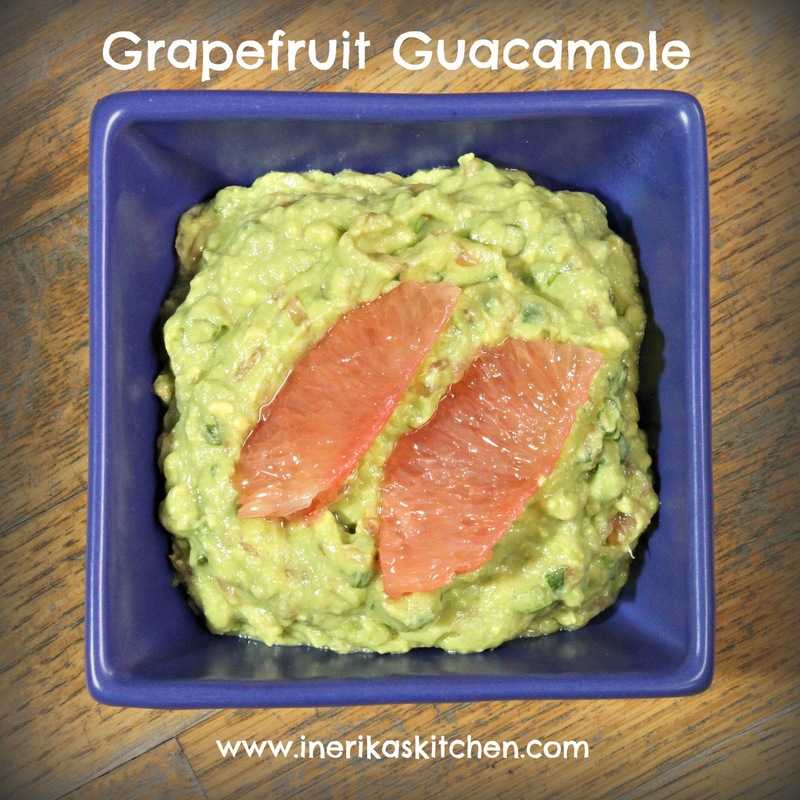 I would have never though of using grapefruit in Guacamole, but this sounds really great. I love your ideas for pairings too. Salmon seems like a perfect match for these flavors. How cool is that, I will try it next time I make my avocado soup. Even though it had plenty of lime, it started to turn right away.